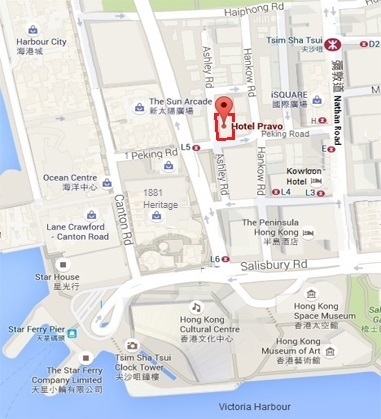 Hotel Pravo Hong Kong is conveniently located within a transport hub connecting the Star Ferry Terminal, Airport Express Kowloon Station and Tsim Sha Tsui MTR. In an ideal location near the shopping malls like Harbour City and Kowloon Park, a pleasant green escape from the city streets. By Airport Express: Board the Airport Express directly from the airport to Kowloon station, which takes about 21 mins. And take a free shuttle bus from Kowloon Station to The Peninsular Hotel Hong Kong, and then walk 1 block to Hotel Pravo.